Knowle West Media Centre invited us to create a mobile engagement tool to collect data from across Bristol on wellbeing provision and the obstacles to engaging with provision. The project was part of a Bristol University Wellbeing study. We created a fold out ‘consultation station’ with a 3D printed brain as it’s centre piece. We used the ‘5 ways to Wellbeing’ as focal points in the game and across the station. ‘Baker’ became the character and by connecting the ‘five ways’ to his brain, you could make it light up. We wanted people to be able to respond in a variety of ways and give different access points. We also wanted to collect data from a range of ages. The prop needed to fit in a car, but have impact on the street. The 3D brain drew people in and once engaged we could invite them to respond by writing, drawing and by ‘mapping’ their local area using simple building blocks. 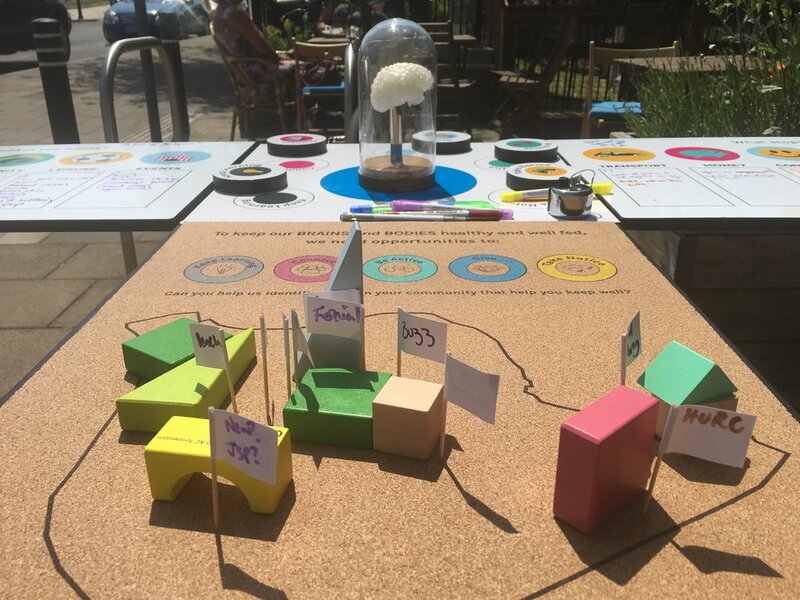 The ‘mapping’ was a playful way to connect residents into their physical place and we could then identify geographical gaps in wellbeing provision across the areas we worked in. We spent time in 4 areas of Bristol - Southmead, Lockleaze, Knowle West and Hartcliffe talking to local residents in a variety of settings over 8 visits. Take a look at the ‘Connecting the Dots’ report below for more in depth information about the project.